It is carrot soup again! At this time of the year, it is just perfect to wrap up in a blanket with a warm bowl of soup! This is exactly what we were doing last evening with a bowl of this delicious carrot parsnip soup. I had the leftover soup as a cold soup for lunch today and it was equally delicious. So this is one soup recipe you want to bookmark for both winters and summers! I love the simplicity of this one-pot recipe. Chopping, cooking and cleaning all go hand in hand and you are done with all in under 40 mins. And the aroma of fresh thyme with notes of cinnamon and bay leaf is beautiful! I love using fresh herbs, and right now the market is full of fresh thyme, sage, rosemary and other herbs. Maybe I should dry my own herbs for summers instead of buying later. This was the first time I was cooking parsnip (can you believe that!). We don’t see parsnip in local vegetable markets in India, so it isn’t vegetable I grew up with. Probably that is the reason why I never really got around trying one. Until now. For the first time, I wanted it to be a simple, tried and tested recipe. And carrots and parsnips seem like a very popular combination. Carrot is my newest, favourite soup vegetable. There are just so many ways to make the humble carrot soup. I can roast them for soup, or combine them with leeks for a sweeter taste, or like this recipe; make a carrot and parsnip soup. I am sure there are more carrot soup recipes and I am only just starting to learn and make the most of this beautiful winter vegetable. Do share your own recipes or variations of the simple carrot parsnip soup. If you like this recipe, please take a moment to rate it. It will really encourage me. Thanks! This carrot and parsnip soup is warm, comforting and full of delicious cinnamon, bay leaf and fresh thyme flavours. A perfect warm soup for cold wintery evenings and also as a cold soup during summers. Heat oil in a thick-bottomed large pot. When the oil is hot add garlic, onion, cinnamon and bay leaf. Sauté and cook till the onions turn soft and translucent. Add the carrots, parsnip, salt, 3 sprigs of thyme and 4 cups of vegetable stock (or water). Bring the soup to a boil and then cook covered for about 15 minutes till the vegetables are tender. Remove from heat. Remove and discard the cinnamon sticks, bay leaf and thyme sprigs from the soup. I use a slotted spoon to get all of them out. 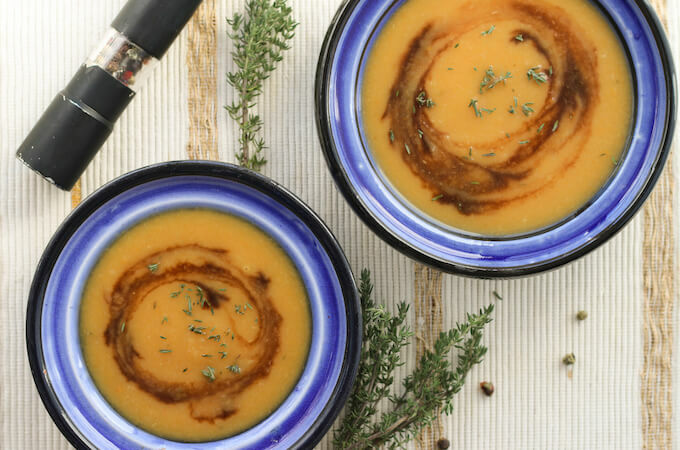 Using a hand blender, blend the carrot and parsnip soup to smooth. You shouldn't need to, but add more water if required. Season with the remaining fresh thyme (removed from its stalk), freshly ground pepper and some balsamic vinegar. Serve hot or refrigerate and serve cold during summers. The soup stays well in fridge for next day. So you can make it ahead for a party. Don't throw away the peels of all the vegetables. Wash them thoroughly and freeze or store in fridge for upto 2 days. Use to make vegetable stock! Let’s start a conversation, share recipes, cooking experiences and food stories from India and around the world. i have never cooked with parsnip..you are not alone…love how creamy this soup looks!!! Thanks Dixya! 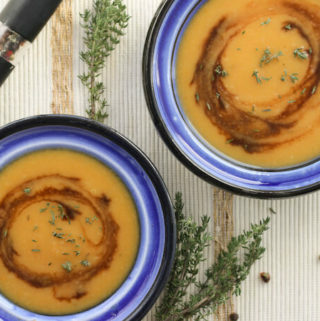 I feel good to find more who haven’t cooked with parsnip yet.. but you really have to try them.. they add a wonderful flavour and body to the carrot soup. I still need to read up on Paleo diet. I have a very little idea of their philosophy. I am so glad you liked the recipe! I have never thought to put carrots and parsnips together. I have to say this sounds wonderful! I will be trying this recipe this weekend! Pinned. 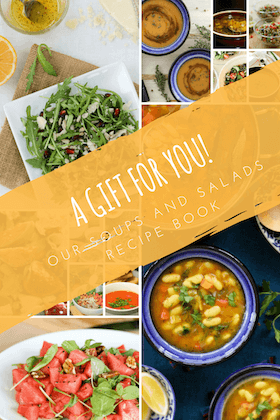 I am sure you will love this soup! Thanks so much for rating the recipe! I so want to try this soup! I love carrots and parsnips, so I imagine this soup is great! So silky and smooth and perfect for fall! Yes! you said it. It is perfect for fall. I’ve been looking for vegan recipes that feature parsnips lately. That is one veggie I haven’t had much of over the years and I intend to change that! Thanks for the idea and inspiration! I am so happy you found this recipe! I am sure you will love the soup especially in this weather! 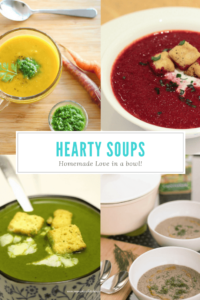 Soups are my comfort food! Well, one of them. This carrot parsnip soup looks so colorful and delicious! I don’t usually cook with parsnips either but I can’t wait to try if it means eating your delicious soup! soups really are so comforting! 🙂 I loved the addition of balsamic vinegar also to the soup.. It gave a nice flavour and also a colourful swirl to the soup! Let me know how the recipe went for you. Would love to know. Thanks so much for rating the recipe! I don’t know why, but parsnips just are not my jam. I haven’t yet cooked or eaten just parsnips but in this soup they combine very well with carrots. Love this as a healthy and hearty weeknight dinner. We’re always trying to eat healthier but its hard when you crave those comfort foods this time of year. This is great! This is comfort food. and just so easy to put together on a weekday night! I am so glad you liked the recipe! I love carrots and parsnips together! I’ve only cooked with parsnips fairly recently myself – for years, supermarkets only had rather sad ones packed with a carrot and some limp parsley as “soup vegetables” at a ridiculous price! So when I started finding them at the farmer’s market, and good prices – I fell in love. And carrots have to be the most underrated vegetable ever. Cheap and readily available yes – but so much more than carrot sticks or salad vegetables! Cinnamon – brilliant. Never thought of it, but I look at this and it sounds just perfect… Now I have to try your soup! I always add one or two warm spices like cinnamon, nutmeg or star anise to soups around this time of the year.. Cinnamon goes great with carrots and also adds a warm earthy flavour to the soup. I hope you try the recipe soon! Let me know how it goes! I’m a huge soup fan and yet I haven;t tackled carrot and parsnip yet. Saving this, looks delicious! There is always a first time! This was a first for me too and I loved it 🙂 Hope you try the combination soon! Thank you so much for rating the recipe! Really encourages me to keep trying new things and sharing! I bake a lot with carrots but I’ve not made a soup with carrots….I’m going to have to venture out! This recipe looks so delish!! YUM!! Perfect for Thanksgiving! This is a great recipe for the season.. and if you haven’t made a carrot soup yet, I really really urge you make one soon.. this or any other carrot soup recipe.. they make a great soup vegetable! This looks like a great soup to add to my winter lunch list! it is perfect for the cold wintery evenings.. and cinnamon adds to the warmth of the soup.. you can also add nutmeg. Thank you so much for rating the recipe. It really encourages me to keep sharing!